The simplehuman 35 liter/ 9.3 gallon under counter kitchen pull-out recycling garbage can keeps trash and recyclables neatly sorted and concealed inside the cabinet. It is the perfect waste bin for installing in your kitchen cabinet to throw away rubbish in your home and keep it hidden. 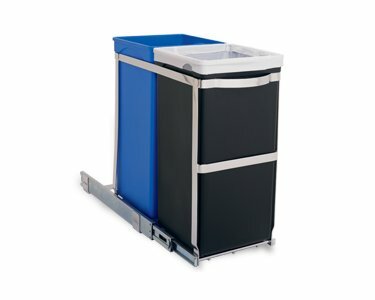 This trash can has an easy-to-install, tough all-steel frame that glides fully out of the cabinet on smooth commercial-grade ball-bearing tracks for quick and easy access. ONE-PIECE PREASSEMBLED TRACK - Easy to install and glides out on smooth commercial-grade ball-bearing tracks. INTEGRATED STEEL HANDLE - Grab the strong, sturdy handle to pull the can out of the cabinet quickly. ENHANCE YOUR TRASH EXPERIENCE - Extra-strong and durable Code D custom fit liners fit this can perfectly for a cleaner trash experience.